EVERYTHING YOU NEED TO HELP SCORE A PERFECT 800. 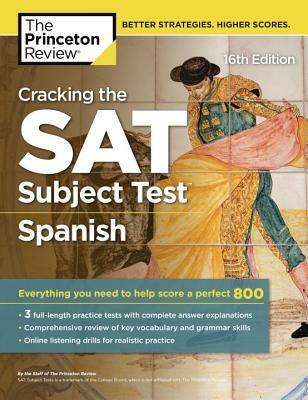 Equip yourself to ace the SAT Subject Test in Spanish with The Princeton Review's comprehensive study guide—including 3 full-length practice tests, thorough reviews of key topics, and online listening drills for realistic practice. We don't have to tell you how tough SAT Spanish is—or how much of a difference a stellar score on the subject test can make in getting into a top college of your choice. Written by Princeton Review experts who know their way around the exam, Cracking the SAT Subject Test in Spanish will help you to achieve your highest possible score.